Experience the life & culture of the Emerald Isle like never before. Stay in top notch luxury and legendary Irish resorts. 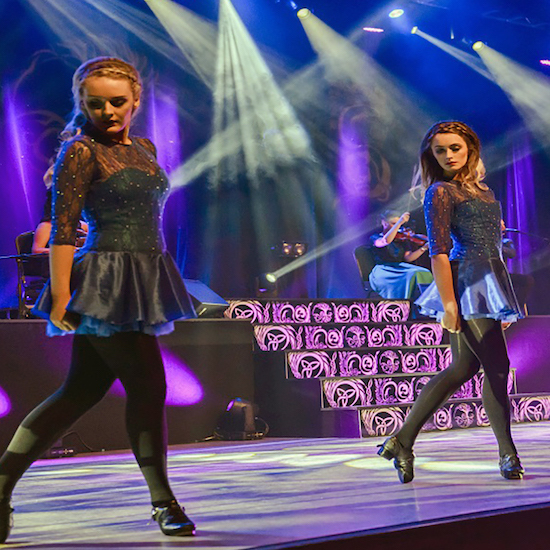 Enjoy wonderful Irish Dance shows in Kerry and Dublin and make memories that will last a lifetime – welcome to the Starmakers Southern Steps Ireland Tour! All transportation, including airport pickup from Dublin international and drop off from the Carlton Hotel where a free airport shuttle will be provided. All entrance fees to various attractions, museums and places of interest including Waterford Crystal, Blarney Castle and Gardens, Gaelic Roots the Live Show Killarney, Celtic Steps Live Show Killarney, The Cliffs of Moher, and Johnnie Fox’s live dance and dinner show. 1 night at Cork’s luxury 5 Star Castle Martyr and Spa with full Irish breakfast. 2 nights at the 4 Star Killarney Avenue Hotel with full Irish breakfast. 2 nights all inclusive dining experience at The Killarney Avenue Hotel in Killarney. 2 nights all-inclusive dining experience at the Connemara Coast Hotel. All-inclusive dinner and live show at the Johnnie Foxes in the heart of Dublin our final evening together. 1 night at the Carlton Airport Hotel in Dublin city with Irish breakfast. 2 places in a Double Room Sharing. After your luxury coach pick up at Dublin airport we drive west towards Galway City, a wonderfully artsy Irish city, brimming with music and culture. 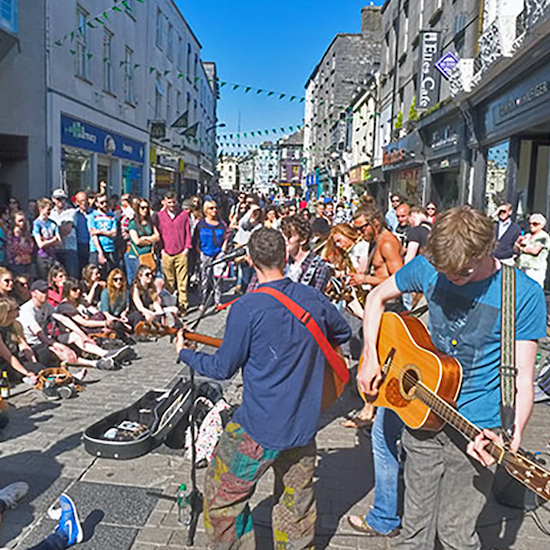 In Galway, we will have plenty of time to enjoy the vibrant downtown area with its street performers, shops, pubs and historic landmarks, enjoying lunch in the city. Our resort tonight will be the wonderful Connemara Coast Hotel, situated right on the beach to the west of the city, where we can relax and perhaps take a swim in the pool before enjoying dinner together, gazing out to Galway Bay. Welcome to Ireland! After our Irish breakfast in Galway we board our coach bound for the famous Cliffs of Moher in County Clare. 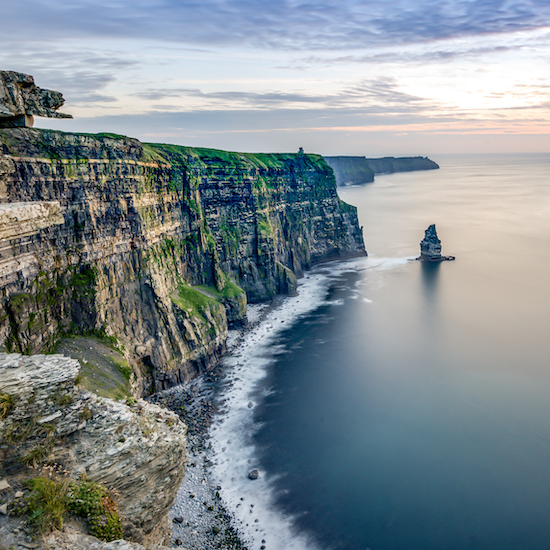 A stunning coastline of sea cliffs towering 900ft above the wild Atlantic Ocean. 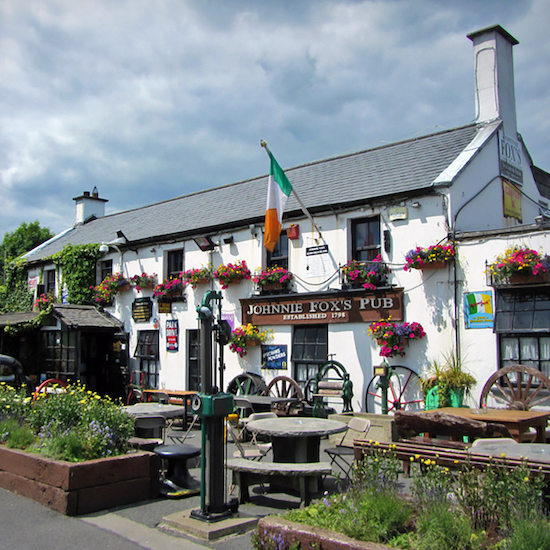 Have your camera ready at this Irish icon before we drive further south into The Burren, a unique landscape of incredible limestone headlands and vistas, with cute villages hidden amongst scenery. We will take time to enjoy the views, shop and eat before our return to Galway, where, on the way back we will also stop off at the scenic Kinvara village and the wonderful Dunguaire Castle, perched on its island in Galway Bay. the way at Adare Village for lunch with its quaint thatched cottages and craft shops. 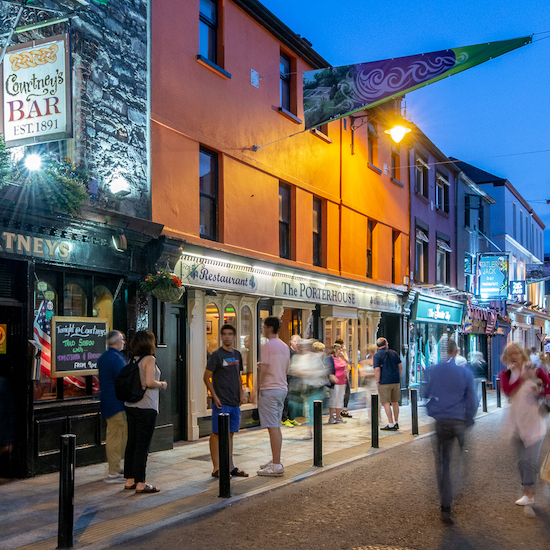 Driving south towards the mountains of Kerry, we will arrive in Killarney with plenty of time to enjoy this fun Irish city with all of its many colorful shops, pubs and outlets. Our hotel tonight is situated right in the heart of downtown Killarney, the wonderful Avenue Hotel, just steps away from everything. We will have dinner together in the Avenue before enjoying the superb Gaelic Roots Show, situated in the special adapted theater right at our hotel. 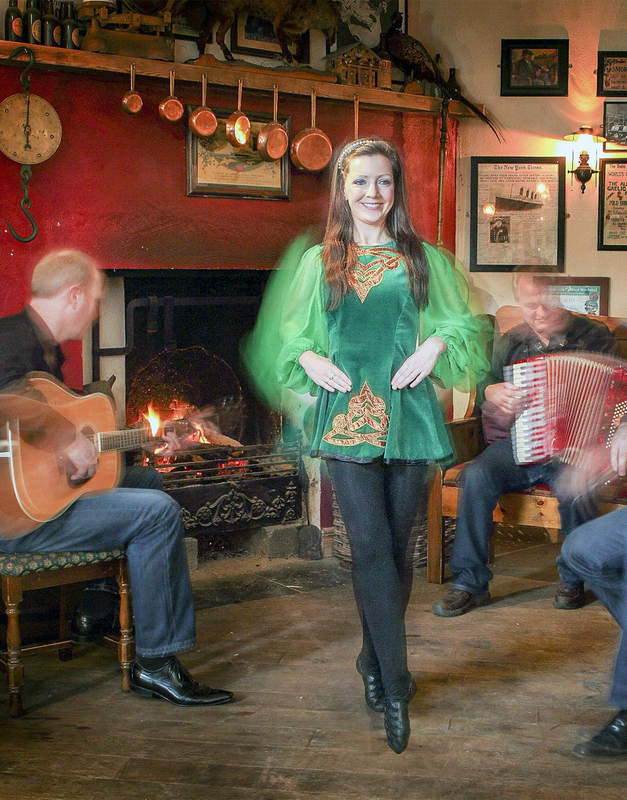 A wonderful night of top class Irish music, song and dance to savor! This morning we leave Killarney for the stunning scenery of the Dingle Peninsula, on the south-western tip of Ireland. Enjoy the expanse of Inch Beach, and the rugged beauty of Slea Head with the Atlantic Ocean crashing below. Gaze out to the Blasket Islands and enjoy lunch in the wonderfully quaint town of Dingle with all its colorful pubs and shops by the seafront, a joy to discover. Then back to Killarney to rest up and enjoy dinner at the Avenue Hotel before we board our coach and take our seats at the famed Celtic Steps Show, a short drive away, one of the best step shows in Ireland! A treat! and gardens. A true Irish landmark. 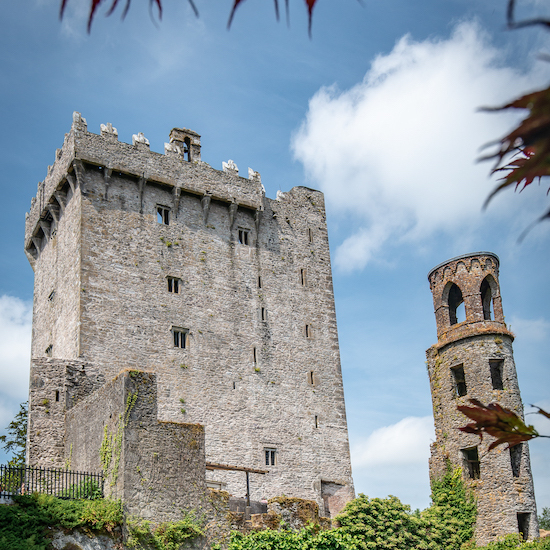 Take time to kiss the famed Blarney stone, enjoy the beautiful grounds, or shop till you drop at the wonderful Blarney Woolen Mills, a five minute walk away with some of the best shopping in Ireland! We will also enjoy lunch together at Blarney Woolen Mills before we continue west to the incredible CastleMartyr Resort just outside Cork City. CastleMartyr is a stunning 5-star resort built around an 18th century mansion, with castle ruins dating back to the 12th century. Enjoy time in the pool and spa area, walk in the grounds and relax at this wonderful Irish resort. 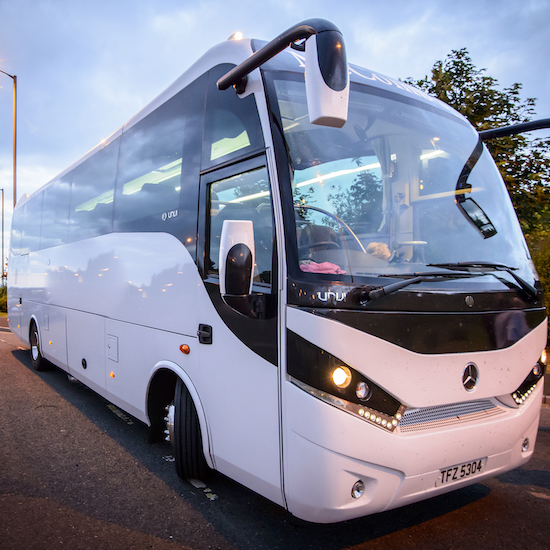 This morning we leave CastleMartyr behind and board our coach to drive north east to Dublin’s Fair City, Ireland’s capital, stopping on the way at Waterford, the site of the beautiful Waterford Crystal Factory. We will take some time to tour Waterford Crystal before setting out once more for the capital city. In Dublin, we will enjoy yet another incredible dancing experience at the one and only ‘Johnnie Fox’s’ pub, where we will experience dinner and wonderful dance in this unique setting. So much fun! After the show at Johnnie Fox’s, we travel to our final hotel destination, the Carlton Hotel, close to Dublin’s international airport. The location of the Carlton Hotel is close to the airport for today’s departure!